As we get ready to bid summer adieu, we’re attempting to mentally prepare for that day upon which we have to put those favorite sandals into storage, not to be pulled from the depths of our closet until near Memorial Day. The only thing that will make it better? Boots. As we enter the fall season, we’re faced with some of the chicest wardrobe essentials the world of fashion offers us and, to our good fortune, fall boots ultimately top the list. Whether you’re looking for ankle-height Chelsea boots or an over-the-knee stiletto heels, there’s something for every style when it comes to fall boots. From minidresses to jeans, midi skirts, and work-ready suiting alike, there’s nary a look in your closet that doesn’t have some fall boots to accompany the outfit. As you look to update your collection, though, think affordable, as many of our favorite boots for fall are all under $100. From velvet to leather and everything in between, shop our favorite styles here. 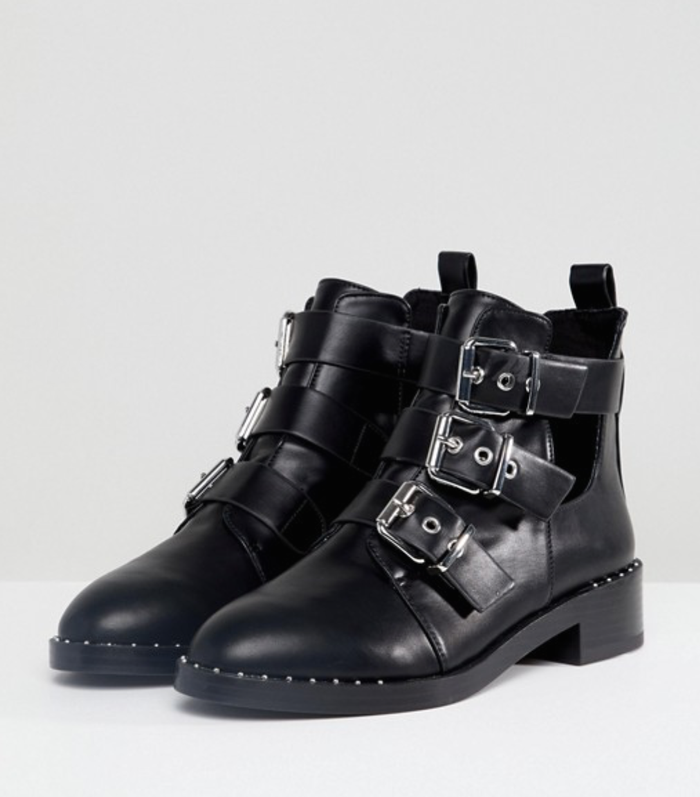 Go edgy with three-strap moto boots. Channel your inner equestrian in a pair of retro Chelsea boots. Keep it mod with suede ankle styles. We love this grungy take on the Chelsea style. Available in sizes 6 to 10. Consider patent leather when reaching for that new pair of black boots this fall. Be bold in a bright red tone. Available in sizes 5 to 7. We can't get enough plaid in our lives, so we're definitely opting for the pattern on our boots this fall. Consider velvet when opting for even boots as casual as these. The boots you can wear anywhere. Go plaid, but make it elevated with a pointed-toe heel style. Infuse a little color into your wardrobe by way of a soft pink. Switch up your all-black boot game with another neutral, like tan. Everything is better in velvet. Now that's one way to wear white after Labor Day. Think: London in the '60s. The chicest affordable over-the-knee boots for day or night. Available in sizes 6 to 9. Navy: for the black-bootie lovers who want to branch out a little more this fall. We love the chunky block heel on these over-the-knee boots. For an evening look, consider a thigh height with stiletto heels. Your boot game has never been stronger—or more affordable.